Mega Sale! 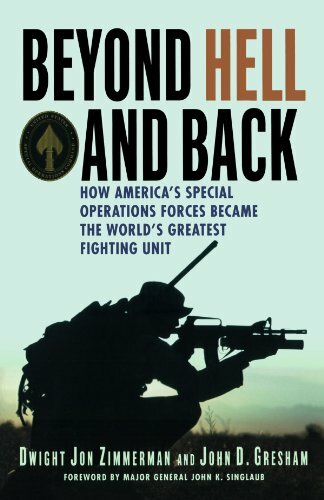 Save 25% on the Beyond Hell and Back: How America's Special Operations Forces Became the World's Greatest Fighting Unit by St. Martin's Griffin at Prensa Digital PR. MPN: black & white illustrations, maps. Hurry! Limited time offer. Offer valid only while supplies last. An inside look at seven of the most harrowing and significant Special Operations missions ever.Courage beyond reason. Loyalty beyond faith. *THE RESCUE OF BAT-21: The largest and longest Combat Search and Rescue mission in the Vietnam War lasted 17 days and cost the lives of 13 Americans―all to rescue one man and the invaluable knowledge he alone possessed. * TASK FORCE NORMANDY: Planned in secrecy and executed with flawless efficiency, Task Force Normandy was an Army/Air Force Special Operations joint op that fired the opening shots behind enemy lines in Operation Desert Storm. eight members of the rescue team. This failure ultimately led to the creation of Special Operations Command. *BASHER 52: Captain Scott O'Grady was shot down over the "no fly" zone above Bosnia, and his daring rescue was one of the Marine Corps' finest operations ever. These are a few of the dramatic true tales that represent the defining moments that helped shape the operational methods, planning, and deployment for all future Special Ops missions. BEYOND HELL AND BACK is the greatest collection of Spec Ops missions ever assembled.